The concept of the “beginners mind” is something very important for those involved in Zen cultivation practices like myself. With my decision to take-up kendo as a sport [I am a beginner at the Dasmarinas IGA-Kendo dojo] it is now more urgent for me to live out this ideal. This is not my first attempt to learn the art of the sword. But when I stepped inside the Dasmarinas Village covered court last month: I made a resolution to enter as I am: an adult beginner trying to learn the sport with a “beginners mind”. Here I have to let go of the false pillars of my sense of self-worth: my age, my academic credentials, my accomplishments in other fields—all these mean nothing inside the dojo. I am starting with a big fat zero…a tabula rasa like a child. I often fail, make mistakes, repeat the same errors but there’s no time to wallow in embarrassment and shame. Entering the Dasmarinas IGA-Kendo dojo for the first time last month, I was pleasantly surprised to find little kids doing stretching exercises together with the grown-ups. What was more interesting was that the practitioners form a single circle, which created the impression of an egalitarian group. Whatever differences there are in age and skill became superfluous. I knew then that I will be comfortable practicing with the group. It takes one whole village to raise a child. We can re-rephrase it too: “it takes one whole dojo to raise a warrior out of a little boy”. It is interesting how my senseis, senpais and us beginners surround these kids like doting parents. And why should we not? These are our “babies” [so far this is the only sports club that I know of that literally have “whole families” in its roster]. Thus Sensei Koji Igarashi’s interesting tags: Johnny papa, Marlette mama etc.]. Practicing with kids around is really a zen-like experience for one interested in the “do” of the sword. Children are spontaneous. They don’t know the concept of fear. Thus despite their funny movements [which appears cute for us adults], they somehow learn faster, they intuit the essence of the art more, they don’t have doubts, they are always focused at the present moment, thus they perform better. I guess I will never truly appreciate Kendo if not for my training in Zen. I think being an adult and an academician at that is really more of a disadvantage in the art that puts prime emphasis on the “clarity of mind”. I use my left brain for a living and often it is still active even while practicing basic stances…thus nervousness sets in and I cannot perform well. The inner critic [the superego] then enters the picture and starts the negative inner-dialogue. In one Zen documentary, a master was asked to define Zen. The master quoted Jesus of all people! : “unless one becomes a child one cannot enter the kingdom of heaven…Zen is essentially that…being a child again.” Training with children around is a constant reminder for me that there’s no ego to boost here…but one to break. Children like Rafa, Vinnie, Sydney, Ats and the rest are tabula rasas—-they are simple. Give them instructions and they do it with such simplicity..such is the empty mind of the ego-less beginner. With nothing to gain..nothing to lose…nothing to achieve..they enjoy the experience. And that’s what I failed to experience during my previous forays to kendo. My mindset was simply wrong. My perspective is blurred by an ideal that does not correspond with reality. Bringing my zen training in the dojo this time around makes me more appreciative, less conscious of my mistakes, less anxious of what comes next. I simply have to enjoy the present: no matter how tiring it is. No dreams of being a great samurai. No goals to set. Just being what I am at this moment is enough….I learned it from Zen meditation practice. I also learned it from kids of the Dasma dojo. Yes the adults in the dojo adore these kids. But they are not mascots. They are kids who are embarking so early in the “do” of the sword. If the big men and women in the dojo find the presence of little kids practicing uplifting…it’s probably because they reflect the essence of the empty mind..the beginners mind. We love these kids who train with us every week because in a way, they point to us the direction on how to approach the art without preconceived notions and concepts. Too bad I was not there to witness the first shiai of the kids. But the pictures suggest that enjoyed every bit of it—-as all practitioners should. 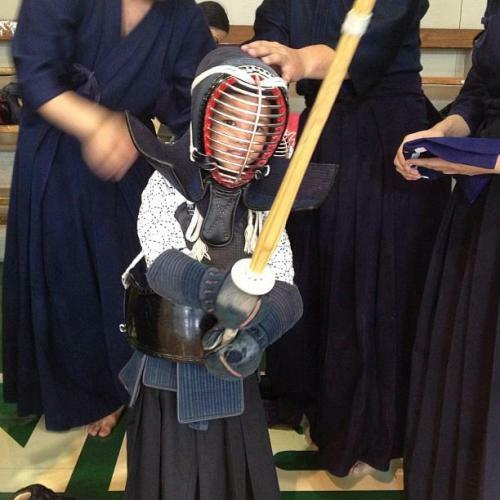 It seems ironic that these kids, who do not seem to take kendo that seriously, always ends up performing seriously well! And after the heated sparring, they take off their bogu, and forget about kendo. They run around the place as friends—-oblivious of whether they won or lost a match. At time I am thinking if it’s okay to give a “rei” to these kids—in a very real way—-they are our little senseis. This article has been reposted from the author’s original one. The author is a beginner in the Dasma IGA-Ken Dojo. You can check his original article and other dojo and martial arts related posts in his blog below. This entry was posted in Concepts, Instructors, Kendo, Stories / Testimonials and tagged beginner, blogging, dasmarinas village, Dojo, Iga ken, Iga Kendo, IGA Kendo Club, Igarashi, Igarashi Sensei, kendo, kids, Koji Igarashi, Martial arts, Philippines. Bookmark the permalink.